Arms survey, there 82 to 95 firearms per 100 people in the United States; or a total of around 270 million to 295 million firearms. No question, there are a lot of firearms in America, but what isn't clear is how many Americans own them. There isn't any national registry that allows tracks ownership levels, for the record I would be opposed to such a registry, and there probably won't be any time soon due to massive opposition by 2nd amendment right organizations such as the NRA, GOA and the SAF as well as many other libertarian and small government advocacy groups. Recently, in the last few years, firearm ownership has become a hot topic for proponents of strong government policies. Left leaning individuals like Michael Bloomberg have spent millions of dollars pushing for gun restriction, as well as donating money to political candidates campaigning against public fiuges who have stood up for 2nd amendment rights. The most recent example being Sheriff Clark's reelection campaign. If your not familiar with Sheriff Clark, he made waves a few years back when he made videos advocating that citizens in his county arm themselves to protect themselves from criminals. This kind of statement isn't exactly unusual with Sheriffs, many of whom preside over pro-gun rural counties but Sheriff Clark was an unusual case. Unlike many of the Sheriffs who announced their support for the 2nd Amendment in the past, Sheriff Clark presides over a decidedly urban/suburban Milwaukee County with almost a population of just under a million. In Sheriff's Clark's recent re-election, actually a primary but the county is heavily democrat so the primary is in fact the actual election for all purposes, Bloomberg donated $ 150,000 to his opponents; Bloomberg was unsuccessful. Individuals like Bloomberg have had some success in advancing their cause. In response to the Sandy Hook mass shooting Connecticut and New York passed new legislation that restricted magazine capacities, certain firearms and/or required registration as well. Those have been some high profile victoriess for gun control proponents, however, there have been some major victories for supporters of 2nd amendment rights as well; with the most recent being the ruling in Florida that doctors cannot compel a patient to answer whether or not they own firearms. The battle over firearms ebbs and flows between the two groups but, in general, the bulk of the victories have been going to 2nd amendment supporters. Some of the most noteworthy victories were overturning outright gun bans in Chicago and Washington D.C, and the Supreme Court ruling that the 2nd amendment protected individual right versus the group right favored by many left leaning politicians. Since that devastating blow towards the left wing interpretation of the second amendment. a theme has consistently been brought up by various groups and media sources. That theme is that the NRA, and other firearm rights groups are spending massive amounts of funds to influence legislators to appease the whims of an increasingly smaller minority of Americans. Over the years periodicals such as the The New York Times, CNN, and many others, have put out articles stating that gun ownership in America is declining. The question being, is this true? Fire arm ownership levels have been polled for many years now tracking firearm ownership levels in the country. 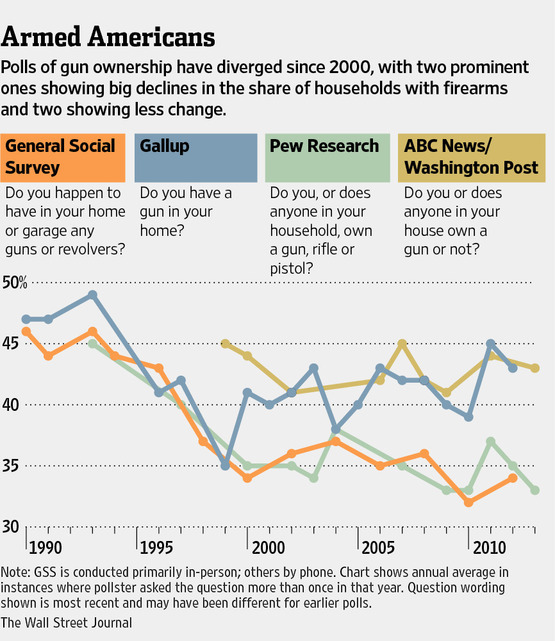 The stats most often used by those stating that firearm ownership has declined use data from the General Social Survey which show a marked decline of firearm ownership from 1973 to now; however, Gallup has also done their own surveys on firearm ownership and according to that poll firearm ownership levels have generally been steady. This presents a unique an incomplete picture and makes any claims about declining ownership uncertain at best. As you can see in the image above each poll not only shows differing level of ownership but the general trend of that ownership as well. If you look only at the GSS or Pew Research you would determine that only around 35% of American households have firearms and that there is a general downward trend. If you looked at only the Gallup or the ABC/Washington post poll then firearm ownership is around 45% and has been holding steady. Two different worldviews can be drawn from these polls. The question is why, as it is unusual that polls taken over long periods of time diverge as greatly as they are. According to some, such as criminologist Gary Kleck, it depends on how the survey is conducted. One possible culprit is wording' however, the Director of Pew Research stated that after their doing their own research they found that the variations in how the question were worded didn't have much of an affect. The issue could be who is answering the question, with men far more likely to admit to having a firearm in the house than women. One other issue is the noted reluctance by many firearm owners to answer pollsters honestly. In 1987 Arthur Kellerman, a doctor who has done research on firearms and firearm related incidents, sent a survey asking if their was a firearm in the household to addresses that were listed in the firearm permit registries. His purpose, to see if those permit holders would respond truthfully. Of the 35 responses he received, 31 answered truthfully which would indicate that around 88% of gun owners would answer questionnaires honestly; however, what surprised him was that there were also 20 households that did not respond. When he went to investigate he found empty lots. In other words those permit holders had knowingly lifted a false address in order to keep their real home residence a secret from the authorities. If this polls is indeed accurate, then that means that 36% of those polled intentionally tried to hide the fact that they are gun owners. This sort of phenomena has repeated with the recent 'assault weapons' registration in Connecticut. Only around 11% of all estimated assault weapons holders registered their weapon by the deadline set forth in the law. If you look at the bottom of the Elway Poll they asked respondents whether or not they owned firearms. 49% of respondents said they did not while 35% said they did with 15% not giving an answer either way. This question to ask is why would a person refuse to answer the poll. There aren't many good reason why a person who did not have a firearm would refuse to answer, at least not in my mind. The poll isn't government funded, nor is personal information kept, which takes the possibility that non-gun owners do not want the fact that they do not own firearms to get out. On the other end, taking into account that difficulty some pollsters have had getting accurate counts from past polls from actual firearm owners, there is the real likelihood that a portion of those who refused to answer either way are actually gun owners. I don't have any way to determine how much of that 15%, however, taken into account the results of Kellermans own test some interesting numbers come up. Using the results from Kellerman's test I am going to examine the Elway poll numbers. Kellerman's study showed that 88% of firearm owners who answered the survey answered truthfully while 12% did not. In the Elway poll, 17.5 respondents indicated that they owned firearms. Adding in the additional 12% who would lie, that raises the numbers from 17.5 to 19.8. If Kellerman's results holds true, this means that 39% of poll respondents own firearms while 44% do not. This is a change of around 5 percentage points from the base numbers from the Elway Poll. Now, accounting for the fact that 36% of houses in the Kellerman poll were fake addresses, this means that we should expect a no response for 18 individuals polled. The actual numbers who failed to answer either way was only 7.5, just under half the number expected. What this means is that, either the number of failed responses for Kellerman were abnormally high, or there are more individual who responded no than we anticipated. I am going to assume that Keller's numbers are typical, which means that those who refused to answer can be counted as gun owners. This could raise the number of gun owners to from 19.8 to 27.3 out of the 50 registered voters, or 54% of all registered voters. The trick is to now figure out how many gun owners there actually are. As of 2014 of Washington's roughly 6.897 million residents there are 5.3 million who are over the age of 18. This isn't the number of individual eligible to vote, that itself is a moving metric for a variety of reasons, however, according to voter registration information 76% of those eligible to vote register. This means that the eligible voting population in Washington State is 5,023,539 or 72% of the states population, the rest are either under 18, non voting felons or alien residents of some sort who do not have voting rights. This gives us some sort of clue as to how many firearm owners in Washington State. We have no information whether non-registers eligible voters would have firearm ownership levels mirroring registered voters, but for the sake of simplicity I will assume that this is the case. There is also no information how about legal residents, who are not eligible to vote, but are eligible to own firearms, I will refrain from guesstimating that number entirely. So, for the purposes of this exercise, I am going to assume firearm ownership based on the aforementioned eligible voting population of Washington State. If we take the poll at face value, and ignore that a percentage of firearm owners will conceal the fact that they own firearms, that means that our of the 5,000,000 or so eligible voters, there are 1,758,238 if we take those that answer 35% at face value. This is most certainly not accurate and represents a number that is too low given that we now some percentage of firearm owners will lie to pollsters. If 12% of all registered gun owners lie then, backing the number out, we come to the number of gun owners at 1,997,998 of registered gun owners; or as we noted earlier 39.7% of the eligible voter population. If we take the next step and assign the percentage of voters who had 'no response' as gun owners, then the number of gun owners skyrocket to 2,712,711 of all registered voters. This is 54% of all eligible voters, 51% of the state's population that is over the age of 18 and 39% of the entire state population*. If those numbers hold true for Washington and if they can be extrapolated throughout the rest of the country, then based off the current census estimate of 316,000,000 Americans, then there are 123,400,000 Americans who own firearms, or 39% of the entire population. Keep in mind though, Washington State ranks 36th out of 50th for firearm ownership in the country. This is from an pretty old survey, as far as surveys go, and the reported firearm ownership levels for Washington State rose by 2 percentage points from 2001 to now but I digress. The point being that if Washington, which ranks as one of the lesser owning gun states, has more far more firearm owner than expected, then the same most likely holds true for the rest of the country. Before I close out there is one other item I want to note. The numbers I have guesstimated are for firearm ownership stated on the number of individuals who own firearms, whereas most polls ask if there is a firearm in you household. This is an interesting conundrum given that the number of individuals in a household vary from 1 to perhaps a dozen in the extreme instances. The average household size per the last US census is 2.61 individuals per household. There are over 115,000,000 households per the last census, which based on the surveys means that anywhere from approximately 39,100,000 to 51,750,000 households have firearms or 102,051,000 to 135,000,000. It should also be noted that multiplying the household factor by the number of households under counts the population by around 16,000,000. My number is right within these ranges, however, the biggest omission is eschewing those under 18 in my calculations. Those who are under 18 but live in gun owning households would add to the total number of Americas owning firearms. This is something that is very important point to remember. It is often stated that demographics is destiny, and it has been noted that, among white Americans, conservatives are out breeding liberals and that a persons politics often aligns with their parents politics. Gun ownership is often portrayed as a predominately white conservative thing, which is not entirely true as there are minority and non-conservative gun owners though it is true enough that groups like the NRA have noticed and sought to redress, and if that holds true with gun ownership then there is a likelihood that gun ownership could rise. *This is one method of calculating the number of firearm owners in Washington State. When I assume that 36% of respondents lie about firearm ownership, the percentage of firearm owners rises to 69% for those over the age of 18 in Washington State, or 3,669,135. I don't normally post on items concerning the red pill, gaming or any combination of the three. It's not my forte and it's not something I am really interested in despite the fact I hold an opinion that there are aspects of its world view that I think are vital for young men; more history, geopolitics and economics over in my end of the pool. I will make an exception in this instance because the article that was forwarded to me is just too funny. I will issue a caveat in that this whole entire exchange could be a complete and utter fabrication, if you read the post you will see why, but nonetheless, I want to share it. My fiancee forwarded me an post from some blog called wetindy, never heard of it before and she has never mentioned it, and apparently a young 20 something woman asked what she needed to do to marry a wealthy man. The text below. You can see what I assume is a picture of her from the blog post if you want to verify her assessment of herself. My own opinion is that I can see why she thinks she is very attractive though there are tell tale signs of crazy. She gets a response from someone who supposedly is the type of man she is looking for. It is priceless. Put the details aside, what you’re trying to do is an exchange of “beauty" and “money" : Person A provides beauty, and Person B pays for it, fair and square. By the terms we use in Wall Street, every trading has a position, dating with you is also a “trading position". If the trade value dropped we will sell it and it is not a good idea to keep it for long term - same goes with the marriage that you wanted. It might be cruel to say this, but in order to make a wiser decision any assets with great depreciation value will be sold or “leased". The response is so perfectly red pill save for the first sentence of the last paragraph, that I strongly suspect that this is either a) entirely fabricated or b) that the person who responded is a troll with an epic trolling ability and red pill world view. If this is whole exchange is indeed as it appears, then that young women got the best education in here entire life and a massive salvo from the first rate ship of the line the U.S.S Reality that has blown a whole below her ego's waterline. A person with a newly-minted degree is entering a highly-competitive environment known as "work." In this environment they are charged with one, and only one thing: Being worth more to the company, net-net, than they cost in compensation and associated expenses. That's the beginning and end of it, when you get down to how business, hiring and "human resources" work out. No business can stay operational if it operates at a net deficit in this regard and as an applicant, no matter your credentials, you are not special or an exception to this rule. A quote from this blogger who says that he, or she, occupies the slot of CEO for a company. It cannot be stressed enough that college should be viewed as an investment and that currently, as investments go, they are pretty terrible ones. Obamacare was passed some years ago, and recently came into effect, in hopes that it would make health care more affordable. Myself, and millions of other Americans, are extremely skeptical that it will accomplish this goal for a whole host of reason, however, one of the major reasons why it will fail has not been addressed by many health care reformers and detractors of obamacare. Recently I went in for a physical and elected to have a comprehensive blood work tests done. I recently have received my claim from my health insurance plan, a high deductible HSA, in regards to what I owe. Below is the information posted directly from my account into this blog. Usually when a legislative body passes laws it is safe to assume that little real good will come from it. But there are cases when a law is passed and I actually think something good will come from it. In this instance I am referring to a law that has passed with a seal of approval from a committee of Florida state senators. This proposed law is the meant to reconcile an issue that anybody who has a concealed carry permit, or has taken a gun safety class, should know. This issue is that the brandishing of a weapon, or firing off a warning shot, in the hopes of deterring someone who clearly intends you harm could land you in trouble.